To help protect Victoria's environment, Caulerpa taxifolia has been declared a noxious aquatic species. This Declaration is effective from 11 November 2004. From this date, a person must not bring into Victoria, or take, hatch, keep, possess, sell, transport, put in any container or release into protected waters Caulerpa taxifolia. 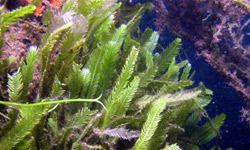 Caulerpa taxifolia is a green macroalgae (or seaweed) commonly used by marine aquarists as a food source and decoration in marine aquaria. 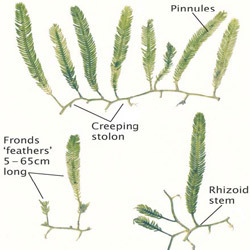 It features creeping main stems and appealing feather-like fronds. It spreads by growth from the stolons (stems) and can also form a new plant from small pieces broken from an existing plant. A new plant may form from a piece as small as 1 mm and this piece may survive out of the water for up to 10 days. Consequently it can spread on anything that has been in the water including boats, wetsuits, boots, fishing tackle, ropes and chains. To allow people to dispose of this species, a 90 day amnesty period applies from 11 November 2004 to 8 February 2005. During this period, people who possess this species should dispose of it in the recommended manner. It is an offence to bring into Victoria, take, hatch, keep, possess, sell, transport, put in any container or release into Victorian waters Caulerpa taxifolia under the Fisheries Act (section 75). If you own a salt water aquarium and believe you have Caulerpa taxifolia please dispose of it by putting it, including all roots and substrate media, in a plastic bag, placing the bag in the freezer for at least 24 hours, then disposing of the frozen material in a rubbish bin. Do not release the species by flushing down the toilet or sink or placing in a drain or waterway. A widespread species, indigenous populations of Caulerpa taxifolia are found in tropical areas in the Indian, Atlantic and Pacific Oceans, Mediterranean Sea and in Queensland, Australia. Currently Caulerpa taxifolia is not found in the wild in Victoria. 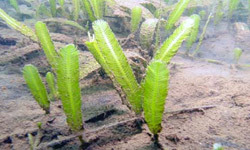 A fast growing strain of Caulerpa taxifolia, originally developed for the aquarium trade, titled the 'aquarium' or 'invasive' strain, has invaded areas of New South Wales and South Australia. These populations were probably introduced through the release of an aquarium specimen, and were spread through survival of small pieces of the species in things such as fishing nets and anchor ropes. The invasive strain of Caulerpa taxifolia cannot be differentiated from the native type without complex genetic tests. The invasive strain has the potential (based on its known depth and temperature ranges, and invasive history) to spread over most Victorian marine waters if it were released in to the wild. The invasive strain of Caulerpa taxifolia, by spreading over large areas, competes with native species such as sea grass. In other areas where it has invaded, Caulerpa taxifolia has replaced large areas of seagrass and fish populations are reduced, as fish do not generally eat it. Internationally, Caulerpa taxifolia has caused significant problems in places as widely apart as the Mediterranean Sea and California. Between 1984 and 1997, ninety-nine invaded sites around the world totalling more than 4,600 hectares were found. The purpose of the Declaration is to remove Caulerpa taxifolia from circulation within Victoria and therefore reduce the risk of it being released into the wild. Caulerpa taxifolia has been declared as noxious in New South Wales and South Australia. Caulerpa taxifolia has also been declared an unwanted organism under the New Zealand Biosecurity Act and Plant Pest Accord. What should I do if I think I have found Caulerpa taxifolia in the wild? * Water depth (if possible). * Type of sighting (e.g. on seafloor while diving, on anchor chain, from shore). * Description of the infestation (e.g. piece of plant, whole plant, large area). * Your contact details (if possible). Please leave the plant where it was found (if possible) and do not disturb it as this may lead to its spread. Will it be possible to eradicate the weed if it becomes established? This weed is very difficult to control once it becomes established. Prevention of establishment is the most effective way of limiting spread. Control measures in South Australia and New South Wales include increasing salinity levels through covering the weed with salt. Refer to the National Introduced Marine Pest Information Site (NIMPIS) website for more information regarding control mechanisms. There are a number of other species that can be used as are placement for this ornamental plant in salt water aquaria, including other Caulerpa species. Your local aquarium retailer will be able to provide you with advice on alternative species. Please contact the VFA Customer Service Centre on 136 186.